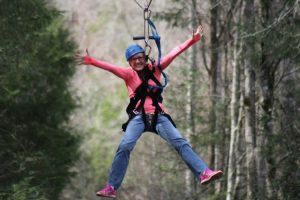 Everyone does a top 10 of the best places to eat, but we like to be a little different here at Foxfire Mountain Adventure Park. There are a hundred and one places to eat in Gatlinburg, but here are the top 6 in our opinion. Whether your looking for world famous pancakes or tips on the local favorites, this list has you covered. Historic and delicious, the Old Mill restaurant has plenty to offer! Old Mill has been around since 1830 and was always a local hangout. From settlers trading goods, having the first post office next door, hosting soldiers during the civil war, to finally becoming the restaurant that it is today. There is no question of the long standing history at Old Mill. It is currently the most photographed mill in the US. The Old Mill earns a 4 out of 5 stars on Yelp, 4.8 out of 5 on Google, and a 4.5 out of 5 on Trip Advisor. One yelp reviewer raved that the historic restaurant was “Some of the BEST food you’ll find in Pigeon Forge. Every time I’m in Pigeon Forge I always make a stop at the Old Mill. Great desserts, too!!! !” Another wrote, “OMG!!!!! What a restaurant, wish it was around the corner from me. This place has its own village for a quick walk through with shops and a blacksmith. This has to be the Gem of Pigeon Forge.” With all the great reviews, it’s expected that there will be a wait to be seated, but according to many customers (ourselves included) it is most definitely worth the wait! Old Mill is one of the most popular places to eat in Pigeon Forge and it’s not hard to see why. The prices aren’t bad, the food is great southern cuisine, and there’s plenty to take pictures of! Although the food is delicious southern style, it’s not super greasy or anything. The prices are fair and the portions are HUGE! To take a look at the menu and see what all they have to offer, click here. With an old fashion charm, The Old Mill has everything you’re looking for in a southern restaurant. There is ample parking and plenty to look at including a little blacksmith area. Everyone is extremely hospitable and smiles aren’t difficult to find here! The address for The Old Mill is 164 Old Mill Ave, Pigeon Forge, TN 37863 or, click here to pull up directions. Make sure to add this one to your must eat list. Log Cabin Pancake House is a nostalgic step back in time to pioneer days. With its rustic charm, it is a popular spot amongst locals and tourists alike which is saying something as there is a pancake house on almost every block! The staff are very helpful and friendly. With this combination, Log Cabin had to come in at number 2 on our list! Another person on Yelp said “We have eaten at the Log Cabin Pancake House as a tradition nearly every time we visit Gatlinburg simply because it is consistently that good. So many choices, but my favorite is the simple, but perfect, buttermilk pancakes with the warm maple syrup.” Log Cabin Pancakes tends to have a recurring theme of satisfied guests who want to keep coming back. There are plenty of choices on the menu and you can have your pancakes almost any way you could possibly think! The prices are one of the lowest in the area and the staff are super friendly. There is usually a line out the door, but don’t let that deter you because it moves quickly. Most guests don’t wait more than 10 or 15 minutes. Take a look at what the restaurant has to offer on its menu! The atmosphere here is old fashioned and rustic. It’s very relaxed and the wait staff are known to be very friendly. The prices are well worth the huge portions you receive and the restaurant is very accommodating. The address to Log Cabin Pancakes is 327 Historic Nature Trail, Gatlinburg, TN. It’s pretty easy to find. If you would like the directions to be on the safe side, click here. Plan to eat here one morning, you can thank us later! Cherokee Grill is an upscale all-American steakhouse. It is set in the Smokies with the outer appearance of a lodge. It has an elegant charm about it and there is usually not too much of a wait time. This restaurant specializes in the freshest seafoods and of course, steak! There are many great reviews of the Cherokee Grill including this one from Yelp, “I was really impressed from the moment I walked into this establishment. Upon entering I noticed how nice the interior was, the seating area was superb and the lighting was pure classy.” Another person from Yelp stated that “If you come in the area go to Cherokee Grill. The service was extraordinary, the food wonderful, and the atmosphere was relaxing. I ordered the rib-eye and it was incredible. Didn’t even need to use a knife to cut it. We are planning another trip this way soon and this place is on the agenda.” With Yelp ratings at 4 out of 5 stars, 4.3 out of 5 for Google, and 4.5 out of 5 on Trip Advisor, it’s no wonder people flock here. The menu at Cherokee Lodge is pretty lengthy, so prepared to bring your decision-making skills! Don’t worry though, anything you decide to order will be the right choice. Everything is cooked to perfection and it doesn’t take long to get your food. The prices are a little higher than others on our list, but you are paying for high quality food. To preview the menus (yes, there are multiple) before you get there, click here. The dining experience here is a relaxing one. The restaurant gives off a comforting vibe, and the staff make you feel at home. We recommend this restaurant for a romantic evening out or for a classy brunch with friends. Cherokee Grill is located right off the strip at 1002 Parkway, Gatlinburg, TN. If you need more directions, you can find them here. Sawyer’s is a locally owned restaurant and is very popular with the locals. They are still a relatively new restaurant, only being open since 2014. In that time, they have acquired a decent following of returning guests. Unlike other restaurants on our list, Sawyer’s is only breakfast and lunch, closing at 2 pm. Though it is still pretty new, the reviews speak for themselves. One Yelper says, “In a town where there are so many awesome breakfast alternatives, this was our favorite during our recent vacation to Gatlinburg. Just a few miles from our cabin located in the heavy tourist area of Pigeon Forge. Can’t miss the large rooster out front.” Another stated, “The best breakfast in Smoky Mountain. I enjoy eating waffles rather than pancakes, but the corn beef hash selection was amazing not from the can. Everything is homemade from the whip cream to the syrup. You must stop by and enjoy a great breakfast with your family and be happy to start your day. Friendly staff and host. Fast service and delicious.” On Yelp and Trip Advisor Sawyer’s is rated a decent 4.5 out of 5 and a 4.6 out of 5 on Google. They may be newer, but it appears they are making their mark! Sawyer’s is only open until 2pm, but they serve breakfast the whole time. They also have a decent lunch menu and the pricing is pretty average. The amount of food you get is definitely enough to fill you up without being too much. To see the menu options you can click here and choose what kind of menu you would like to view. Known for its down-home style, Sawyer’s is a relaxed restaurant. Friendly staff and a calm atmosphere, Sawyer’s allows you to wake up and start your day right. There are plenty of tables and a roomy atmosphere. Located at 2831 Parkway, Pigeon Forge, TN, you can’t miss it. Just look for the giant rooster! But in case you need some help, here are more directions. Also located in Pigeon Forge is the Local Goat Tavern. With a name like Local Goat, we had to test it out. This restaurant specializes in craft beer and craft drinks. They also only offer food that is locally sourced and sustainable. Local Goat is surrounded with great views and plenty of fun places to visit. There is plenty of buzz around Local Goat, most people come in because the name is just too intriguing. Here are what a couple of Yelpers had to say, “We stopped in for an early lunch and a drink because we loved the name. The interior is very sleek and inviting. The cocktail and craft beer list was impressive! Our server/ bartender Blaire was very helpful and knowledgeable of the menu.” Another said, “I’ve had burgers from all over the world and this is easily the best. (Farmhouse Burger) Take this seriously, since I regularly eat at Red Coat Tavern in Michigan, which is known to have THE best burgers in the world. Local Goat beats it. Period.” With a Yelp and Trip Advisor rating of 4.5 out of 5 and a google rating of 4.6 out of 5, it’s certainly worth a try! There are plenty of amazing items to try and you won’t be disappointed with your choice. Although they are open until 11pm, we recommend going here for lunch as their burgers are a hot item. Local Goat is fairly priced and the portions are pretty big. So bring your appetite! Everything is locally supplied and home-made in-house. This alone should be reason enough to come! Click here to view the menu and daily specials! Local Goat has a more modern feel to it. There are plenty of TVs to watch sports on, or play one of the games they have in to restaurant/bar. The atmosphere is a calming, relaxed one. This is a place where you can come in, grab a craft drink, and let your cares fade. Local goat is located on the strip in Pigeon Forge at 2167 Parkway, Pigeon Forge, TN. For further directions, click here! Last, but most certainly not least is our very own Zippin’ Pig Barbeque! After spending a day zip-lining and hiking at our Adventure Park, our very own restaurant will hit the spot with its delicious barbeque. The portions are decent and the prices aren’t bad either! We take pride in our food and make sure it’s the best of the best. We serve during lunch time every day and are open until Labor Day every year. If you missed us this year, make sure you get the opportunity to come try us next year! 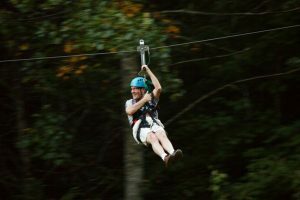 Zippin’ Pig is located inside of Foxfire Mountain Adventure Park and is easy to find, but if you need help, don’t be afraid to ask any of the staff members you see! We can’t wait to see you here!